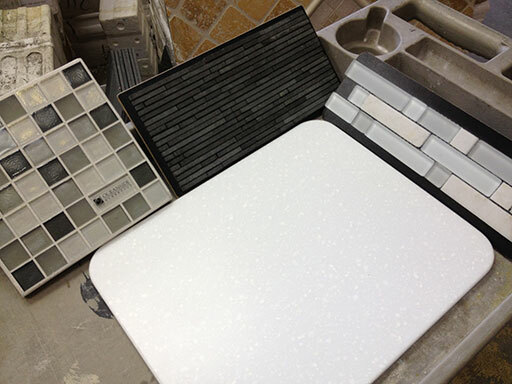 Here are are in Part 5 of our DIY kitchen backsplash – the homestretch! 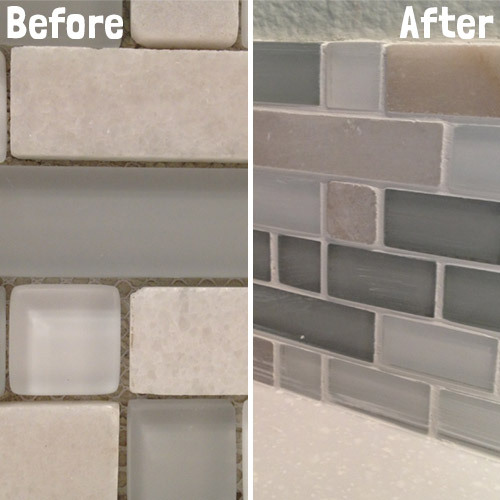 In this detailed post, I’ll show you all the steps to grouting your backsplash tiles. The tiles have been mortared to the wall, and after 20 hours of dry time we’re ready to fill the gaps between the tiles with a non-sanded grout. Tip: Don’t start this step unless you have the next 4+ hours available. It’s like a thick frosting, except not delicious. Get a nice big glob of grout onto the float trowel and smear it on! 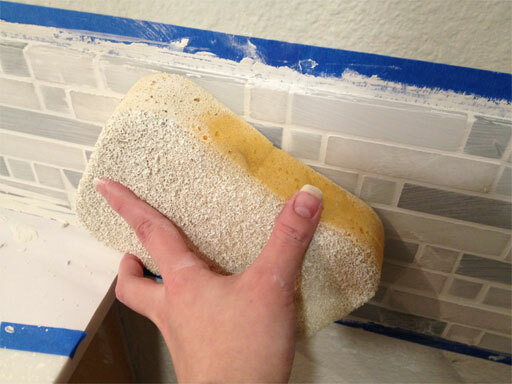 Grouting is messy, tiresome business: apply it with a firm, strong arm so it squishes into the gaps between the tiles. Continue around the entire backsplash. 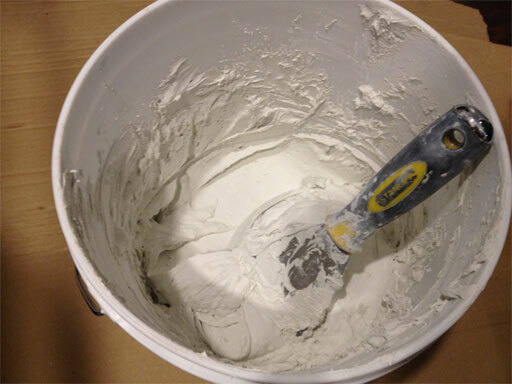 Use your fingers to get grout into corners or places the trowel won’t fit. Our 8 square foot backsplash took the two of us well over an hour to get grout into every crack. 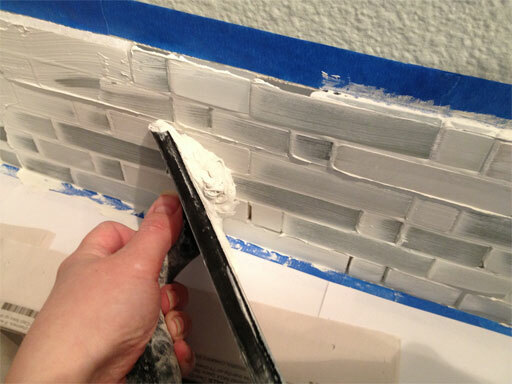 Tip: Remember, you’re working against time here because the grout is slowly drying and hardening as you work. A sheet of plastic wrap over the grout bucket can help slow the drying. If you have a very large area to grout, consider working in phases or getting more helpers. It began with a glob of grout. I used my fingers to stuff grout into the corner where the tiles meet.. 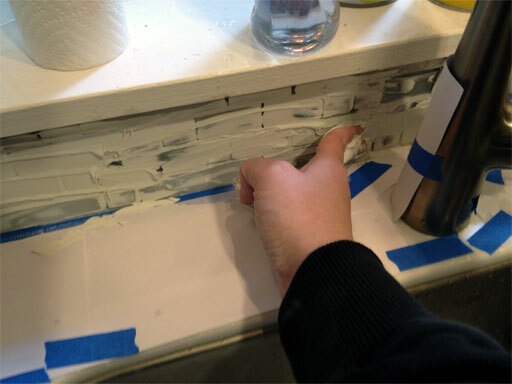 Fingers are useful for getting grout into tight areas, such as corners. When about 75% of the cracks were filled, my helper switched to using a moist sponge to wipe grout off tile faces as I continued applying grout to un-grouted areas. Tip: Go slowly and use a moist, not a wet sponge. 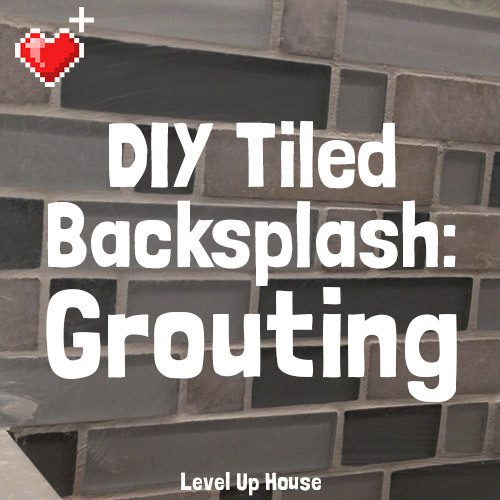 Remove grout in layers. 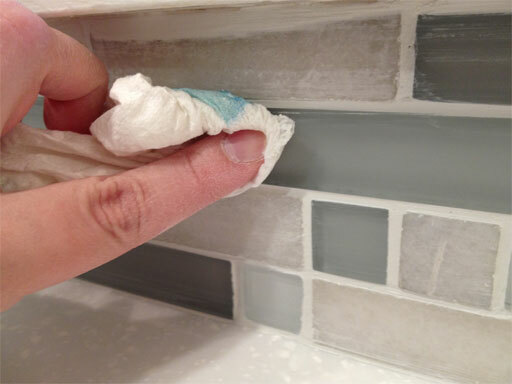 If the grout in the cracks starts to flow out of the cracks when it gets wet, wait 10 minutes before trying this step again. Once the bulk of the grout was removed from the tile faces, I switched to using moistened paper towels to remove the final thin layers of grout from the tile faces, paying extra attention to the corners. This was tedious, careful work, but it left the tiles looking crisp. 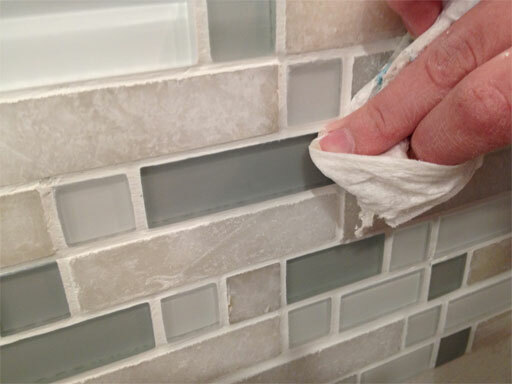 Using a paper towel to remove haze and excess grout from tile faces. Grout is drying as I polish the corners. Polish, polish, polish – this step is super tedious but 100% worth it. Get those corners sharp, it makes a difference! We let the grout dry for just over an hour before returning to wipe any remaining haze off the tile fronts. The grout now has to dry for three days before applying a coat of sealer. Grouting’s done, but there’s still an hour of clean up work to do. 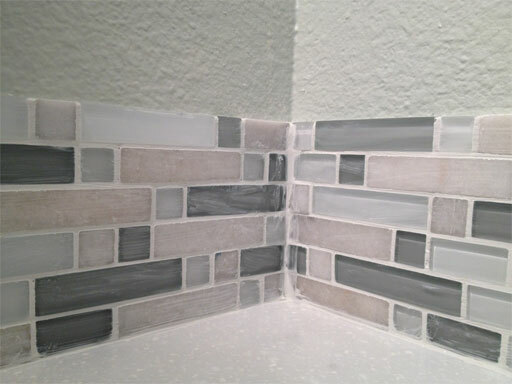 Here’s how one of the backsplash edges turned out . Kitchen cleaned up and looking sharp as the grout dries! 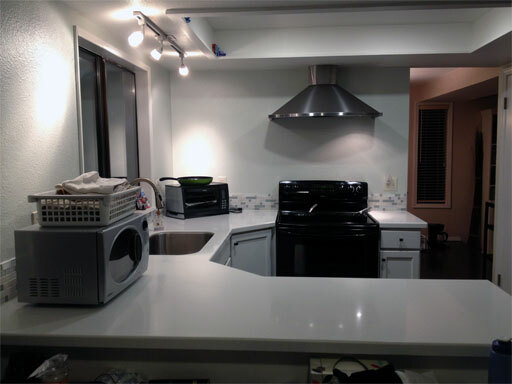 Welcome to Part 2 of our completely modest, totally DIY kitchen backsplash project! In this post, I’ll tell you what to think about when picking out tiles and how to choose kitchen backsplash tiles for your DIY kitchen remodel. 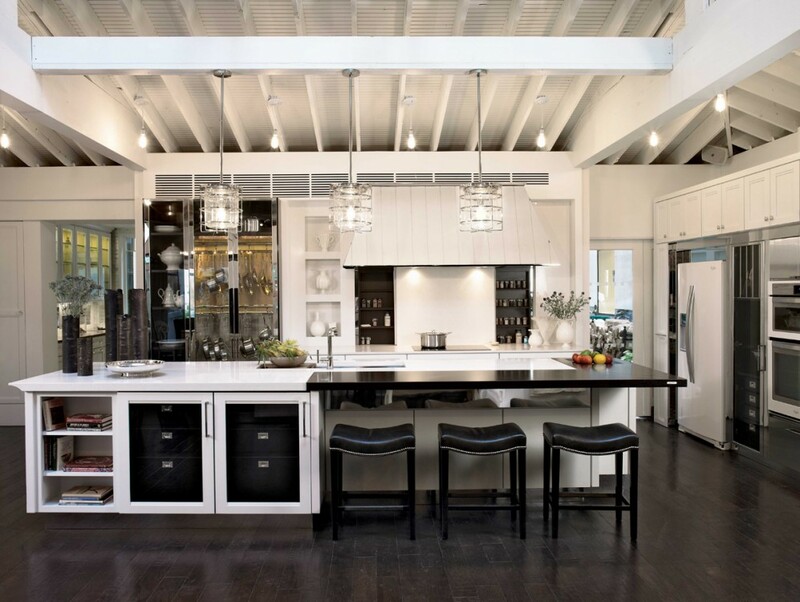 When I was researching kitchen backsplash ideas, I found that most of what I was reading assumed I had a sky-high budget and a kitchen straight out of Better Homes & Gardens. My kitchen’s from 1977, and it’s about what you’d expect from a single family standalone home built 30+ years ago. Contractors we discussed possibilities with wanted to tear out walls and completely change the layout of our downstairs to “modernize” it, but I can’t afford that. 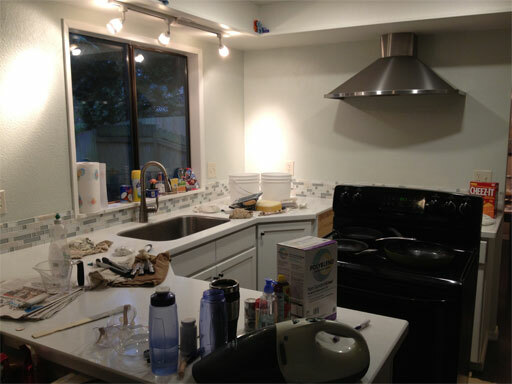 So we’re facelifting this kitchen instead of gutting it, spreading the costs out, and doing as much as we can ourselves. Simple design – like Legos! 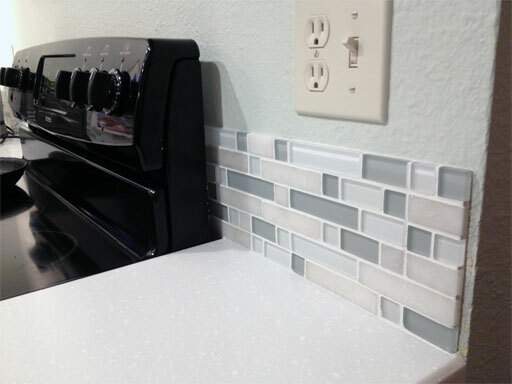 If yours is too, then read on for Part 2 of our DIY Kitchen Backsplash series: choosing the right backsplash tile! 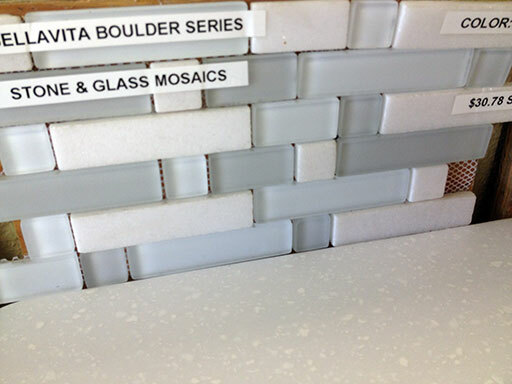 Your tiles will be the single largest expense of your DIY kitchen backsplash. 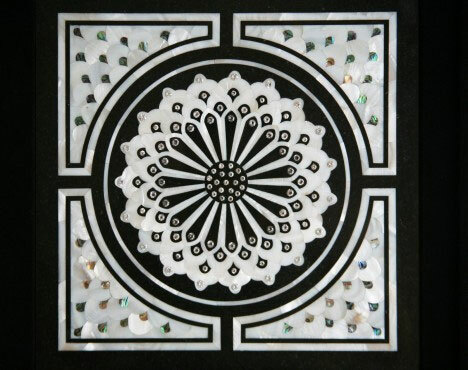 Tile is usually priced by the square foot, and most prices we found were between $18/sq foot and $90+ sq/foot (omg). If you haven’t yet, take a minute to estimate how much square footage of tile you actually need. Next, figure out how much you’re willing to spend. 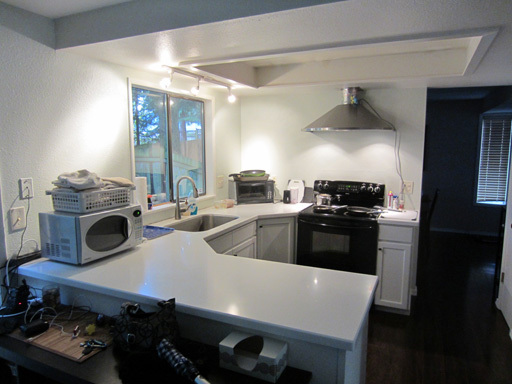 The cheapest you’ll probably get away with is $250-$500 (USD) for a modest, short backsplash. 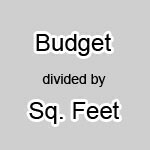 Divide your budget by how many square feet you’ll need. If your budget is $300 and you need 15 square feet, your sheets should cost about $20/each. Figuring this out before you step into a tile store will save you a ton of time: you can just look at the price first, and if it’s too much, keep looking. You won’t waste time on tile you can’t afford. We’re in the Pacific Northwest, and our favorite places for tile are The Home Depot (which is where we got our bathroom tiles from) and Tile for Less (which is where we shopped for this project). If Home Depot is the McDonalds of tiles, then Tile for Less is the Olive Garden. Neither are particularly expensive, and both have enough variety for just about anyone, but it’s a lot easier to “splash out” and spend a fortune at Tile for Less. 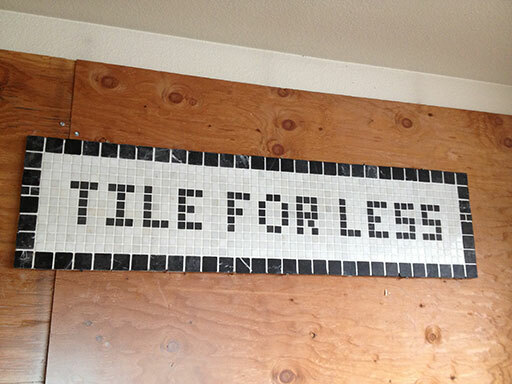 There are two more reasons to visit Tile for Less. 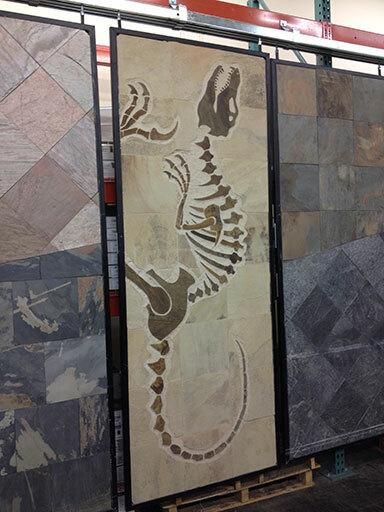 There are also tons of online tile stores. 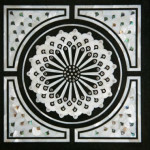 I didn’t shop for tiles online; I just wanted to see the tiles in person and find something locally, but I would have ended up online if Tile for Less couldn’t deliver the goods. There are about as many choices in tiles as there are people buying tiles, so a lot of this is up to personal preference. Under $30/sq foot. Just a simple budget preference. Some sheets we liked were $70+ per sq. ft which I think is just insane for a bunch of rocks you glue to a wall. Your mileage will vary here. So, with all that in mind, you’d probably be surprised to know those criteria didn’t severely limit our choices. This is the tile I liked as soon as I stepped into the store. Bellavita Boulder Series in “Snow” checks all our boxes. I love it. But just to be sure, we wasted another 2 hours looking at more tiles to make sure it was The One (it was). In the interest of sharing our decision-making process, here are some runners-up that didn’t make the cut. 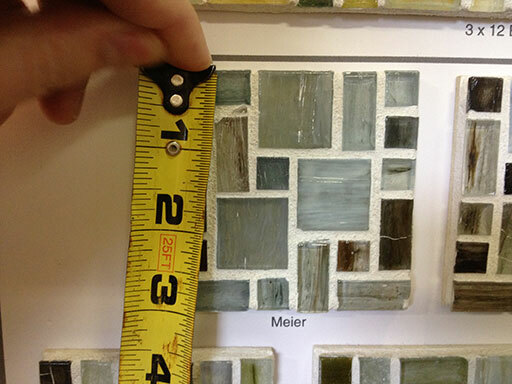 The one on the left was nice, and the 1″ tiles were perfect, but it was way more expensive. The one in the middle was ultimtely too dark and also too many fiddly bits to deal with individually for the edges/corners. I super loved the look of this Meier tile but I didn’t super love its price, which if I recall was like $60 a square foot or something crazy. But I did seriously consider it for a few minutes. We also brought a sample home to look at it there, because I like to be super-duper sure before I spend $300 on a nonrefundable box of rocks. Finally, we bought our 9 sheets and left satisfied with our decision. Our grand total for 9 sheets+tax came to $320. Tile for Less had our tile order ready for pickup in like, four days, so they arrived weeks ahead of our planned November installation. The tiles came in a square box and none of the sheets were broken or chipped. Our box of rocks is home! Stay tuned for Part 3, where we stick our box of rocks to the wall.